CDM-HD serum substitute can be used in 2-compartment high density mammalian culture systems where cell densities exceed 1E+7 cells/ml. Under these conditions cell-secreted conditioning factors play a significant role in supporting the culture and serum can therefore usually be completely replaced with CDM-HD, a mix of low molecular weight compounds that is chemically defined and consistent lot-to-lot. CDM-HD enables the cost, risks and lot-testing associated with serum to be eliminated. 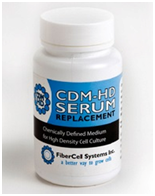 In the FiberCell bioreactor most types of cells require no adaptation period when switching over from serum to CDM-HD. CDM-HD is protein-free and so greatly facilitates product purification. It is also cGMP compliant. 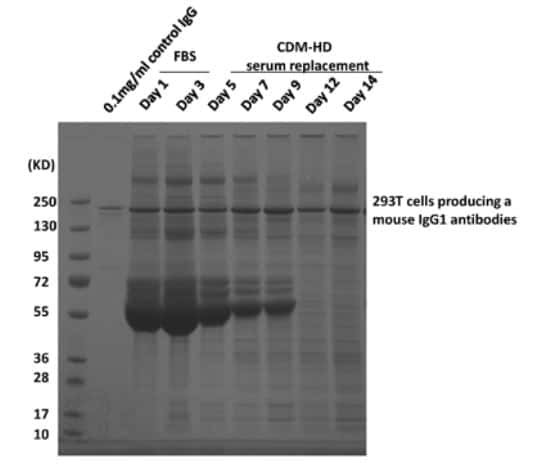 It takes a few days for the contaminating serum proteins to be cleared once the switch to CDM-HD has been made. 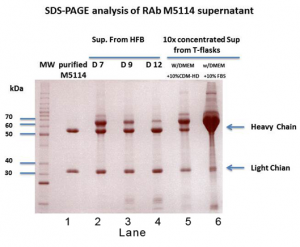 Afterwards the target protein is usually the dominant protein in the unpurified supernatant. 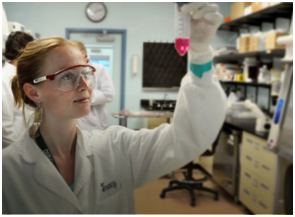 Secreted products such as monoclonal antibodies and recombinant proteins are free of contaminating proteins from the medium and can be purified using simplified protocols, increasing net yield in many cases. Antibody from the FiberCell HFBR was very clean and properly folded. Concentration of supernatant from HFBR: 2.5 mg/ml. Data courtesy of Liying Lu, University of Massachusetts, Worcester, Worcester, Massachusetts. What are the components of CDM-HD serum substitute? 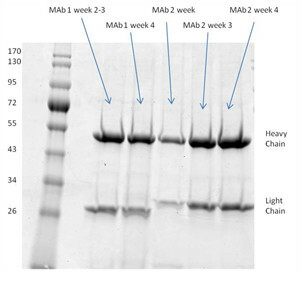 The inconvenience of serum-containing media and the high cost of specialty medias can be avoided by employing CDM-HD Serum Replacement in high density culture systems. "The information you send is confidential and will not be shared with third parties"
(v) susceptibility breakpoints based on a minimum inhibitory concentration (MIC) above which therapy by a specific drug will fail. The HFS-TB is proposed for use in optimization of drug regimens and dose selection to maximize the bactericidal and sterilizing effect rates and minimize the emergence of resistance. When used early in the drug development cycle as a complementary and additional tool to existing methodologies, information regarding optimal dose selection, dosing schedules and potential combination therapies can be obtained. Additionally, the HFS-TB can be used in a post-approval setting to optimize currently used drug regimens (for both dose and dosing schedule) for drug-susceptible and drug-resistant TB. Therefore, the results obtained by the HFS-TB are expected to support trial design for Phase I, II, III and IV clinical trials.